World Forum for Democracy delegates. Image: Nandini Archer. 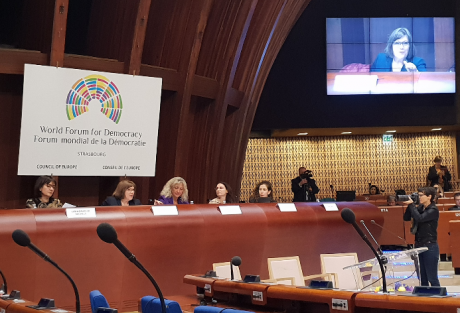 Gender equality in Europe is “advancing at a snail’s pace”, Thérèse Murphy of the European Institute for Gender Equality told delegates at the World Forum for Democracy in Strasbourg, France. Over the last decade, there has been very little progress made on gender equality in Europe overall, she said, warning: “There can be no democracy without mainstreaming gender into every aspect of public life and public discourse”. “The decisions that are being made about our future and our environment are not being made in a gender equal way”, Murphy added, of the stark underrepresentation of women in environment ministries amid climate change concerns. Up to 2,000 people from more than 60 countries are expected to attend the three-day forum, which began on Monday and is dedicated to the Malta journalist Daphne Caruana Galizia who was murdered last year. More than 100 speakers are presenting their work and perspectives, including in plenaries on women’s public, political and economic participation and addressing sexism, discrimination and violence against women. Other sessions will explore topics including faith and feminism, safe spaces in cyberspace, and masculinity and showcase initiatives to tackle gender inequalities and violence against women from around the world. Spain’s Minister of Justice Dolores Delgado, Polish activist Marta Lempart, and Canadian educator and sexual violence support worker Farrah Khan were among those who spoke during the events on Monday. World Forum for Democracy speakers. Image: Nandini Archer. Links between democracy and gender equality, political polarisation and feminism, the impact of sexism on the planet, and the role of the #MeToo movement in forcing conversations on sexual harassment were among the topics discussed. Annika Silva-Leander at the International Institute for Democracy and Electoral Assistance surveyed figures on women’s political participation in different regions and cited several ‘concerning’ trends. For the first time in more than 40 years, she said, more countries are declining rather than advancing in their democratic performance, while civic space is diminishing. “We are deeply concerned about this because we know it has severe consequences for gender equality”, she said, though increased women’s participation is not enough to achieve more democratic societies. Laura Silver, of the Pew Research Center based in Washington DC, spoke about the state of public opinion towards gender equality in countries around the world. While women are more likely than men to say that gender equality is “very important”, she said, in some places there seems to be an even more important “partisan gap” in people’s responses to such questions. In the United States, Democratic party supporters are more than twice as likely to identify as feminists than Republicans, according to the center's research. From the audience, one delegate said that it was urgent to address the backlash in several countries against gender studies and feminism within education systems. Another participant suggested that, amid concern over climate change, if women could “exercise more power that could prevent the destruction of humanity”. On Twitter, another commented: “Reminder: the 50/50 conversation about gender equality erases non-binary folks and dismisses issues faced by trans communities”. The Council of Europe is the region’s largest institution focused on democracy, human rights and the rule of law. The World Forum for Democracy was first held in 2012. Previous editions of the event have focused on youth and politics, connecting citizens and institutions in the digital age, and the rise of populism. 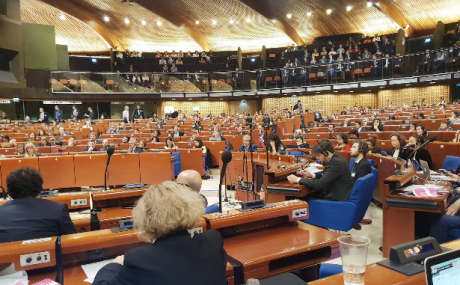 * 50.50 is reporting on this week’s events in Strasbourg as part of openDemocracy’s partnership with the 2018 World Forum for Democracy.